Some fantastic astronomy news which I'd been waiting for since hints were given a couple of days ago on Dynamics of Cats. Two pictures have just been released with images of extrasolar planets. One star with one planet and another with two planets orbiting it. These bring the total of extrasolar planets found to date to around 300, but this is the first time the planets have actually been pictured (around a normal sized star). 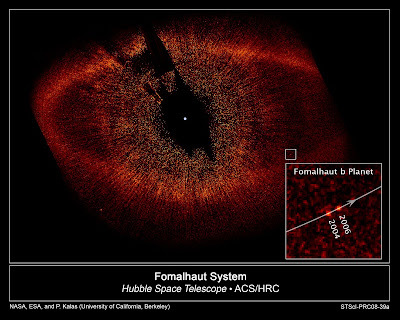 (Image taken from the Hubble press release). For all the details and an explanation of the above image, head over to Bad Astronomy Blog. See also Dynamics of Cats writeup on this news. On a side note, if you're around Galicia at the moment, keep an eye out in the sky, conditions seem to be pretty favourable for solar halo viewing at least over the next few days.